Habit: Rhizomes slender. Leaf: cauline, 2, +- opposite, generally ovate to +- round. Inflorescence: raceme, +- open; flower bract < flower. 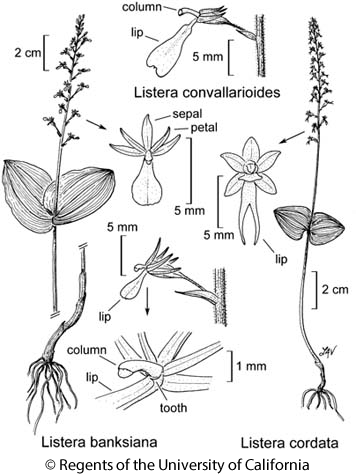 Flower: sepals +- equal, green to +- purple, lower spreading; lateral petals +- like sepals, ascending to erect; lip generally > sepals, petals, spreading to descending, generally wedge-shaped, flat, tip entire to deeply lobed; column subcylindric, straight to curved, anther at tip. Fruit: generally spreading. Species In Genus: +- 25 species: temperate, arctic North America, Eurasia. Etymology: (Martin Lister, English naturalist, 1638--1711) Note: Names available in Neottia (earlier name), with same epithets, for all California taxa if Listera treated as congeneric with that genus. Habit: Plant 10--30 cm. Leaf: blade 2.5--7 cm, base abruptly tapered or rounded. Inflorescence: 2--5 cm. Flower: sepals 3--4 mm; lip 4.5--7 mm, +- oblanceolate, tapered to base, base generally with 2 thread-like teeth, tip rounded, +- entire; column 1.5--2.5 mm. Synonyms: Listera caurina Piper; Listera retusa Suksd. Unabridged Reference: Fernald & Schubert 1948 Rhodora 50: 231--233; Brown 2006 Wild Orchids of the Pacific Northwest and Canadian Rockies. University of Florida Press. xiv + 287 pp. Citation for this treatment: Ronald A. Coleman, L.K. Magrath, Dieter H. Wilken & William F. Jennings 2012, Listera banksiana, in Jepson Flora Project (eds.) Jepson eFlora, http://ucjeps.berkeley.edu/eflora/eflora_display.php?tid=81820, accessed on April 23, 2019. NCo, KR; Markers link to CCH specimen records. Yellow markers indicate records that may provide evidence for eFlora range revision or may have georeferencing or identification issues. Purple markers indicate specimens collected from a garden, greenhouse, or other non-wild location.